Please contact us if you require only one or two of the books in this 3-volume set. The Canadian Contingents by W. Sanford Evans. Originally published in 1901. 352 pages! A classis account of Canada’s participation in the Boer War. This very scarce book is of interest to the collector of Boer War medals as well as the history student. 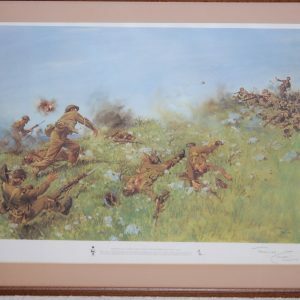 Because of its scarcity, and desirability to the Boer War enthusiast, we reprinted in so the informations could be available at a reasonable price. With the Guns, by E.W.B. Morrison “D” Battery, Royal Canadian Artillery. Originally printed in 1901. 307 pages! A detailed account of the activities, battles and observations of the Royal Canadian Artillery in the Boer War. Morrison won the D.S.O. 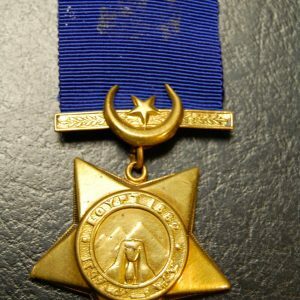 in South Africa and rose to Major General commanding the Canadian Artillery during WWI. Great reading and essential to the Boer War and artillery enthusiast. Again, as an original, a difficult and expensive book to find. 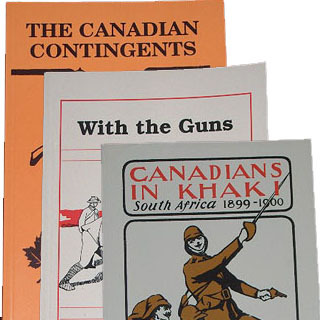 Canadians in Khaki, (The Boer War 1899-1902) 130 pages, cardbound, laminated cover. We discovered this little treasure and decided to reprint it for the benefit of everyone. 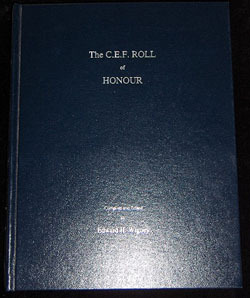 This book contains a listing, by unit, of all Canadians who went to South Africa. It also lists the parent unit, and where there is no previous service, lists the address. All casualties are listed including those killed in action, wounded, missing and those who died of disease.